create a project using ombre! 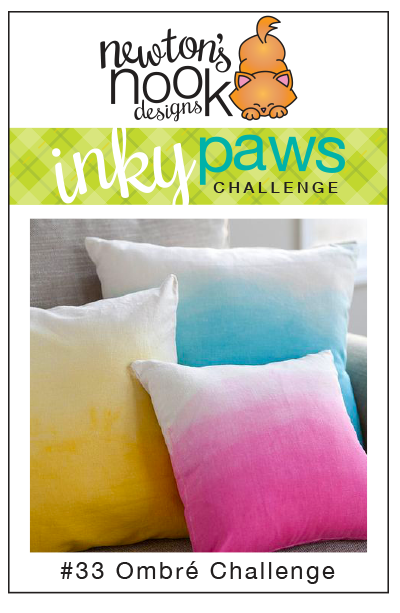 You have TWO WEEKS to play along - Deadline to enter is Friday, July 8th, 2015 at Midnight CST. The winners will be announced on the NND blog. Post your project to your blog or to an online photo gallery such as Flickr, Pinterest, or splitcoaststampers (on splitcoast please use keywords newtonsnook and IPC33). Several of our Design Team Members decided to play along - check out all the awesome Ombré cards they created! Read the description below each card to see who made it. This gorgeous card is by Larissa. She created ombré birds using the bird image from the Darling Duos stamp set mixed with the die cut feathers from the Points & Plumes die set! I Love the dipped gold edges too! Jess created a beautiful purple ombré coffee cup background using the little coffee cups from the Newton Loves Coffee stamp set. Then she colored two cute kitties with their coffee cups too! Crafty Math-Chick used some awesome ombré background paper featuring watermelons and then added on that cute watermelon stamp from our Sweet Summer Stamp set! I love how that yummy melon slice pops off the card! 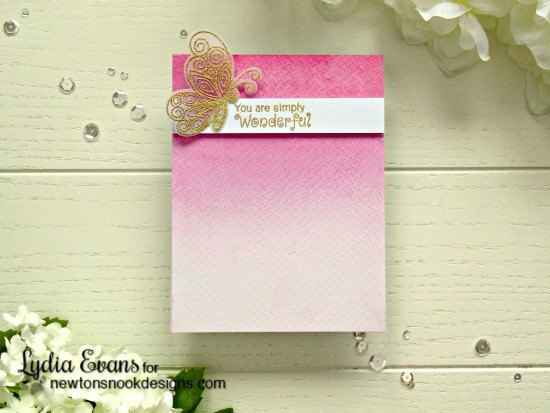 Lydia created this sweet pink ombre background and then added on the butterfly and sentiment from the Beautiful Wings stamp set. I love the soft pink and vellum together! This sweet card by Samantha features the kangaroo and joey from our Hoppy Days stamp set. I love how they're hopping through that gorgeous ombre watercolor background! 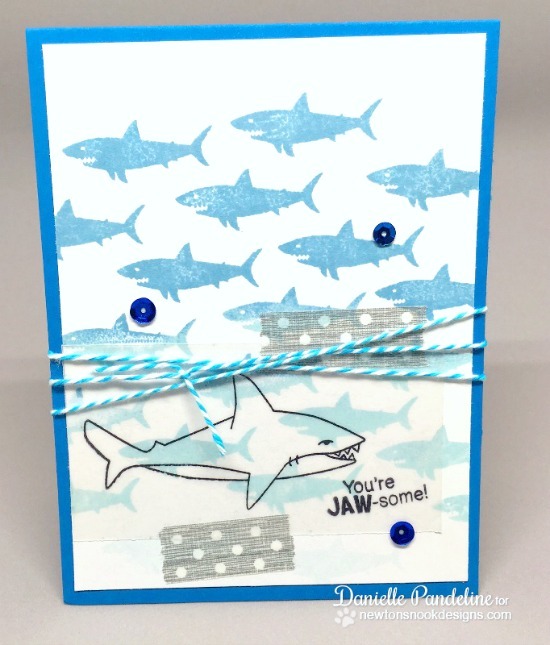 Danielle created a sea of sharks from our Shark Bites stamp set in a blue ombre pattern! All you need is a bold stamp and a couple of shades of ink to make your own ombre patterns! I love the gorgeous ombré background on this card by Yuki! The flower from our Beautiful Blossoms set and butterfly from the Beautiful Wings set really pop the background off so nicely! Here's what I created. I used different shades of blue cardstock to create the ombré and cute them freehand with a scissor to make them look like waves. 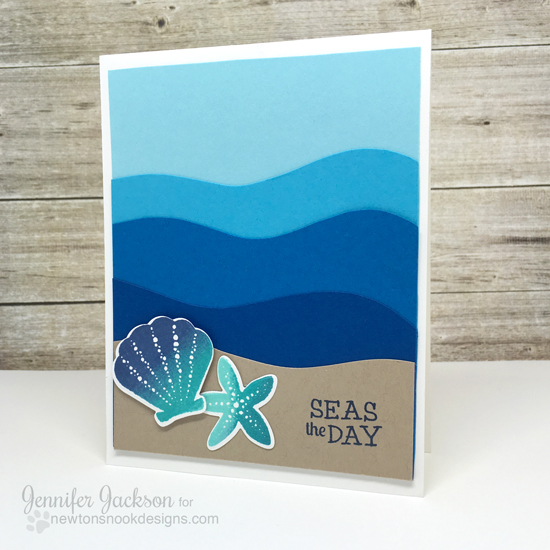 The shell stamps and "Seas the Day" sentiment from our Tranquil Tides Stamp set were stamped in ombré inks and trimmed out with the Tranquil Tides die set.